Virginia Street RAPID Expansion | PK Electrical, Inc.
Reno has a lot to offer from the university to its proximity to Lake Tahoe. Midtown, a once neglected, but now a thriving area, is one ofReno’s many staples. Midtown has recently been revived and it has something to offer for everyone: retail, food, drink, lifestyle spaces, and various services. There are a plethora of small businesses confined in this area making for a unique experience. Only a small portion of businesses in Midtown are located in large commercial spaces, while the vast majority are in renovated homes and unique structures. This area is extremely popular amongst all ages, and due to its popularity, traffic and parking have shown to be difficult. If you have ever walked through Midtown, you may have noticed sidewalks that are half the size of normal ones, deteriorating pavement and a lack of adequate lighting. Due to the fact that this is an enormously successful area, renovations are underway to make Midtown more accessible. The University of Nevada, Reno is home to approximately 20,000 students and has grown tremendously over the last few years. The university has opened three new dormitories since 2012, two of which PK Electrical has worked on (Living Learning Community and Great Basin Hall). There have been other improvements to the campus including new buildings and updates to infrastructure. The school and surrounding area are growing quickly, and the university is trying to keep up with demand. The university’s Master Plan includes various components to improve these areas. Some of the components of this Master Plan include the University District, increased transportation, new buildings, maintaining the history and character of campus, as well as the Virginia Street RAPID Expansion. 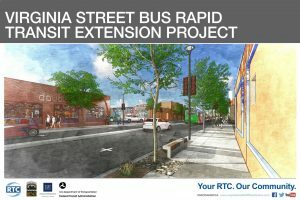 What is the Virginia Street Bus RAPID Extension Project? The Virginia Street Bus RAPID Transit Extension Project and $80 million investment in the Reno community. It will create connectivity for the RTC RAPID route, extending it 1.8 miles from the current 4th Street Station to the University of Nevada. This project is the first of multiple projects stemming from the Virginia Street Corridor Investment Plan and the University of Nevada, Reno (UNR) Master Plan. The project will create connectivity between UNR, downtown Reno, and Midtown. It will encourage economic development, enhance safety, and improve livability in the corridor. Not only will there be roadway and sidewalk improvements, but there will also be aesthetic improvements in order to enhance the affected areas. PK Electrical is working on the lighting design for this project. It will include plans showing existing and proposed locations of street and pedestrian zone lights along the entire corridor as well as electrical service point locations. All street lighting will be per the City of Reno standards. The street lighting will be coordinated with UNR and their Master Plan for the project areas north of I-80. For the Midtown portion of this project, we are specifying decorative poles and light while the university portion of the project will have standard poles and light fixtures. We are providing lighting calculations for the corridor to verify the lighting levels and confirm fixture placements. The lighting calculations do not include ambient light cast by the businesses along Virginia and are based on street and pedestrian lighting only. What Areas Will Be Affected? The Midtown area is being affected from Liberty Street to Plumb Lane and the University District is being affected from 15th Street to Maple Street. 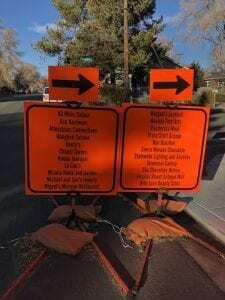 The first phase is from Plumb Lane to Liberty Street; it includes one-way, southbound traffic. Construction began in Midtown on September 4th and all phases will continue until Summer/Fall 2020. For more information on road closures, limitations, or construction updates, please visit the project website where you can receive information about all components of the project. 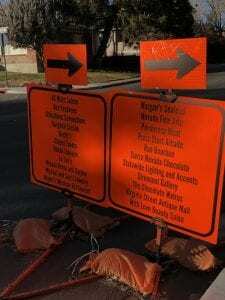 Can You Still Go to Midtown and Areas Surrounding the University During Construction? Yes! The RTC encourages people to come and visit Midtown and the university. They have implemented signage for Midtown and university businesses as well as business support programs to incentivize visits to these areas. Some of the support services include but are not limited to gift card distributions, advertisements for retailers and coordinated activities. Don’t let this construction deter you from going and supporting small and local businesses in Midtown or around the university! For more information or updates on construction for the Virginia Street RAPID Expansion project, please visit the project website. PK Electrical, Inc. is an electrical engineering and low voltage design firm located in Reno, NV and Denver, CO. We are committed to innovative electrical design and focusing on client objectives. If you are interested in learning more about PK Electrical and their contributions to many other electrical engineering projects, check out our website or give us a call.